Click the big green Search button above to see all Bridgeport listings. Valencia Bridgeport is a village located in the heart of the master planned community of Valencia in the Santa Clarita Valley, close to shopping, excellent schools, and restaurants. 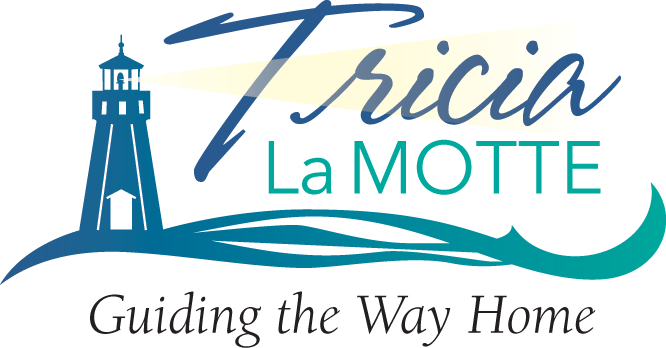 Bridgeport Valencia embraces a nautical theme and offers nine distinct charming home tracts, many with lakefront locations. You'll feel like you're are on vacation and away from the city! Stroll on the 2 miles of lake shoreline walkways while watching the ducks swim past. Enjoy the variety of birds. Smell the delightful fragrance of the plants. Delight at water rippling like jewels under the sun. Find unique gardens, statuary, and water features throughout the village of Bridgeport. Relax on benches offering lovely views of Bridgeport Lake and the nearby hills. Visit with neighbors or have some peaceful contemplative moments. 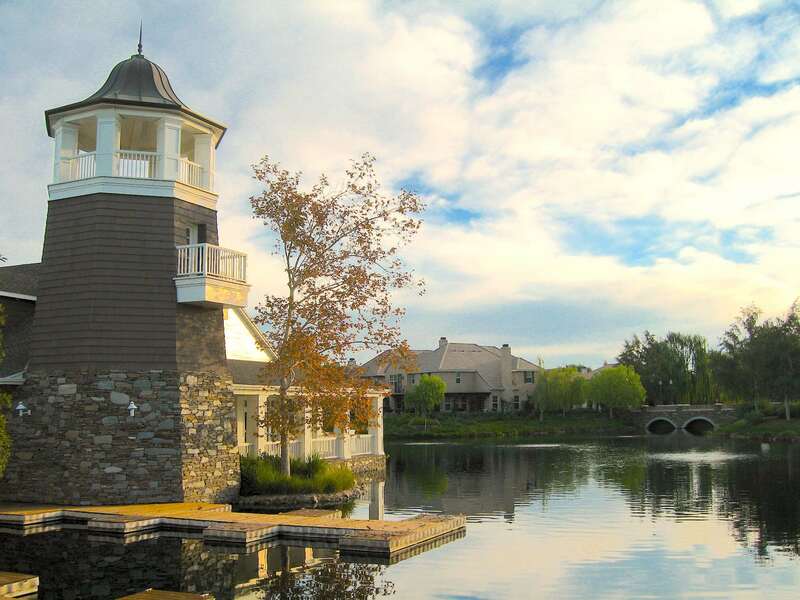 The distinctive Bridgeport Lighthouse and the New England style clubhouse provide a striking silhouette against the Santa Clarita sky. The homes at Valencia Bridgeport have been inspired by homes along the New England coast. Wood trim, front porches, generous windows, and a weathered charm echo the proximity of water. Valencia Bridgeport homes range from sophisticated row house style town homes to gracious executive homes with over 3000 square feet of living space on lakeside lots with lovely shoreline views in a gated section of Bridgeport. The Island and The Colony offer the only gated community homes in Bridgeport. 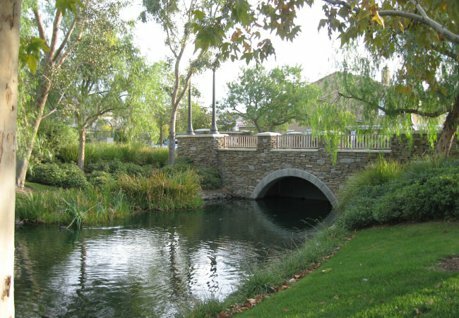 Bridgeport was carefully planned for water conservation with three separate circulation systems and a state of the art filtration system designed specifically for Valencia Bridgeport. Valencia Bridgeport offers 18 acres of parkland, including a traditional 12 acre park with play structures, picnic area, ball fields, and 6 additional acres of open space. The condos at Bridgeport are Spinnaker Point. The townhomes at Bridgeport are Cabot Bay, and Waterford. The Colony is a gated community of single family homes on the west side of Bridgeport Lake. Backbay is also west of McBean Parkway, to the west of the lake. Single family homes on the east side of Bridgeport, where the lake is located, include The Landing. Many of the Landing homes have views of the lake. These charming homes have front yards with white picket fences. Their attached garages are at the rear of the house. This creates a charming look. The homes at The Cove are large homes situated with backyards and many have lake views. 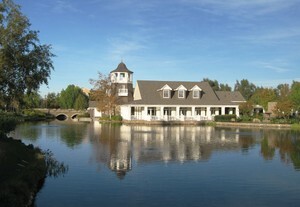 The Island, in a gated community, the largest homes at Valencia Bridgeport, have lake frontage. The single family homes which are located closer to the Bridgeport Elementary school are Stoneypointe.